IF YOU HAPPEN to be in the United States this summer you may want to attend a Happy Belated Birthday Proust party! Alain de Botton, author of How Proust Can Change Your Life, will attend the following birthday parties: July 29 - New York City, Lenox Hill Books, Lexington Ave at 73 St., 7PM; July 30 - Boston, Waterstones; July 30 - Washington, DC, Chapters; August 5 - San Francisco, A Clean Well Lighted Place for Books; August 6 - Berkeley, Black Oak Books; August 7 - Los Angeles, Book Soup. In its highly respected literary section, London's Sunday Times recommends several books for summer reading. Topping the list is Alain de Botton's latest oeuvre How Proust Can Change Your Life which surfaced on Europe's bookshelves last April. "Evocative", "delightful", "charming" are some of the more tepid kudos showered by publications both sides of the Atlantic. Like its three predecessors, this latest 250-page Botton book is expected to be translated in 14 languages. But rather than quote from professional reviews I'll stick to some of the comments made by Botton's literary roadies. At his prompting following the publication of his first book, they were asked to send in their reviews and comments via internet, that most fantastic of communicative mediums. One rooter asserted that the best book to take to the beach after a disastrous affair was Botton's The Romantic Movement. In his first romantic novel, Botton describes a modern relationship exploring the progress of a love affair from first meeting to breaking up, intercut with musings on the nature of art and love. Another arduous fan, whom I shall call by her generic cybername of Rumione, never fails to send in her adulatory perceptions whenever a new Botton publication hits the shelves. She (from some of her comments I am assuming we are dealing with a female) describes The Romantic Movement as a psychological/philosophical study of love, abandonment and possession disguised as fiction. Later on in her review, Rumione exclaims how rare it is to find a male writer who can write from the female perspective as adroitly as de Botton does. Likewise, in her comments on How Proust Can Change Your Life, Rumione informs us that Botton simplified a complicated world. Having just completed the first volume of Proust's novel A La Recherche du Temps Perdu, Botton's treatise gave her a deeper insight into the venerated French author's handling of such themes as love and friendship. "Once again Botton shines in his ability to sensitively express various aspects of love and influence on relationships" says Rumione. What she doesn't say, is that Botton did a fine job on using various Proustian plots to help the reader understand and simplify a complicated world. For anyone wanting assistance in seeking a more spiritual life, Botton's book is a gem, claims another the fawning fan. On Botton's second book, Essays in Love published by Macmillan in January 1995, which is the year Botton turned 25, Rumione had this to say: "A delightful story for anyone who's ever experienced deep romantic love. Particularly intriguing are Botton's insights into the loneliness of being romantically in love and how one reinvents him/herself following loss." While I could not find Rumione's review on Botton's third book Kiss & Tell, written along the lines of a romantic 'diary of a nobody', I came across the following comment by another Botton aficionado: "Kiss and Tell is a bold and irreverent challenge to these biographical norms, which sets out to chart the life of someone unknown, intimate with their biographer, and still alive. The result is a witty and perceptive portrait of a young woman. Brilliant." Anyone seeking to learn more about Alain de Botton and why critics have come to call him a wunderkind or boy wonder must read his books. All four of them. Granted, there are some who may find his works tedious or too cerebral and esoteric. "Why can't the sentence structures be simpler", exclaimed a friend who borrowed my hardback copy of Kiss & Tell. "Is Botton trying to tell us something about himself? If yes, then why doesn't he do so more directly." Another comment from a local "Touche pas a mon Marcel" was, why all the Proustifying?! John Kennedy Toole's waggish Proustian caricature Ignatius Reily certainly draws more laughs per paragraph. If this is about a feeling of temporary blithe and happiness then by all means stick to Toole's Pulitzer-winning Confederacy of Dunces and forget about Botton's book on Proust's neurotic insights. You may rightly or wrongly think Botton is trying to draw laughs, but bear in mind, says London's Sunday Times critic, "this is all a witty exercise in literary criticism". 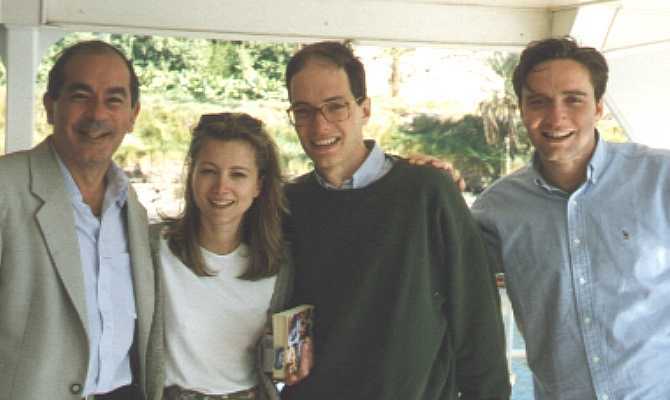 I had the pleasure of meeting Alain de Botton during his two visits to Egypt, the last one being on New Year's week when I was a guest on a private Nile cruise hosted by his father Gilbert de Botton, the successful investment banker who runs the London-based international capital fund GAM (Global Asset Management). One imagines that several days of close proximity on a Nile cruise with less than 17 passengers aboard - even if most were out of Burke's Peerage with titles as long as their pedigrees - would enable you to get to know your fellow travelers. More so, when evenings are spent playing Q* 'after dinner' games. Not so with Alain. What I gleaned from de Botton and from other members of his family was that the author had a Swiss-Mediterranean background (mother is Swiss and father is Alexandrian-born and went to Victoria College); he had graduated from Cambridge and spoke beautiful French; was concerned about his health; and that up until his assassination in 1981, President Anwar Sadat had lived in the Nilefront house belonging to Alain' s great-aunt Marguerite de Botton-Castro. It was only after reading two of his books that I got an insight into this congenial cardigan-wearing, unpretentious fellow passenger. Another thing I picked up from Alain during the cruise was the expression "unputdownable". And this is how thousands of people all over the world feel when they have one of Botton's delectable books in their clutches. From: "Andrew \"Lizard King\" Thomas"
I am one of those readers you mentioned who are in the grip of an obsession about this young author. Some of my symptoms are an inability to leave a bookstore without multiple copies of his works to give to friends, calling others to recite passages I have just read, and now finding myself stalling on finishing the final chapter of his first book "On Love" (I worked exactly backwards from "How Proust...etc.") because I can't bear the thought of not having another book to open when it is finished. I am so pleased to see your account of his family and personal history, because I was playing the role of an FBI agent in trying to construct a psychological profile of someone who is so perceptive about why people think and act the way they do. I suspect that he must have been an academic "enfant terrible" and close to intelligent and nurturing women. A man (and apparently a heterosexual one) who understands women so well is a rare and anomolous occurence. If I knew when his fifth book would be available I would count the number of sentences left in my reading, divide by the number of weeks before his next one is scheduled to be on the shelves and read only the resultant number of sentences per week so no gap would occur in my enjoyment of his genius! Thank you for giving me a glimpse into the private life of this remarkable young man! I discovered de Botton's e-mail address on the web last night, but was intimidated about using it to express my delight with his books. Being so awed by his use of the language, it would be like serenading Mozart with a crude percussion instrument. But you have given me perhaps the necessary encouragement... This morning an image formed in my mind of poor Mr. De Botton shackled to a chair, fed intravenously, in front of a word processor while a series of obsessed fans worked in shifts beating out a rhythm like the slave master on a Roman galley ship - all to insure that the books never stop. Now THAT'S what I call suffering successfully! I became aware of Alain de Botton's work only recently since I got a job working at a huge chain bookstore in the states. I am from California and a young aspiring writer. Your article was the most in depth of those I have located to learn more about the man behind the pen. I have a rather odd question. How exactly do you prounounce his first name? It is like 'Alan' or 'Alon' with the 'a' and 'i' like an 'on' sounding? Also I am curious to why both On Love and Essays in Love are the same story? I am in the midst of reading On Love. Alain de Botton writes about my favorite topic being 'love.' I have been working on and off again one this one novel idea over the past year. Since reading his work it has pushed me and further inspired me to finish up my novel. Thank you for your time and I do hope to hear back from you!